C/ es Caló, 87, 07830 San Jose, Spanje. 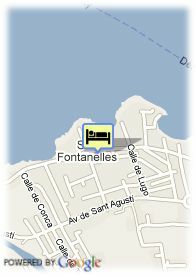 The apartments Sol Post are situated in San Antonios bay, next to Xinxó beach. The centre of the town is only 20 min away, walking on the Paseo Marítimo. Recently refurbished studios, with air conditioning, satellite TV, full bathroom, telephone, kitchenette, mini-fridge, music and balcony. What makes this complex really special is its pool area, with two big swimming pools for adults, solarium and sun beds and a childrens shallow pool with two children´s playground. Waiter service in the pool area from our snack-bar. Every night different UK cabaret shows at our Casablanca bar with our resident entertainers and real parties at our Irish bar Paddy´s, with Irish music and the best sports on satellite TV. Reception 24 h a day with service of change, safe, cars and motorcycles for rent.